When men start resuscitating old myths, women better prepare for fresh tears. Paintball entrepreneur Eero Viitanen lives in a house by the sea with his wife, Aino, and two daughters. Things are fine, but the story’s a little mundane. Eero decides to arrange a little excitement by abducting Aino, the way Zeus carried off Europa in ancient times, and asks his old friend Lari to lend a hand. Aino works at a home for patients with substance abuse and mental health issues, and one of the home’s young residents has gotten into hot water. The two worlds of an economically divided Finland collide, and the resulting interaction doesn’t enrich anyone’s life. 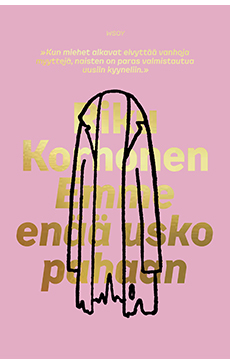 Like self-fulfilling prophecies, Eero’s tall tales about wife-robbing start to come true, with tragic consequences. We Don’t Believe in Evil Anymore deals with the fatal power of stories, a liberal cultural that has forgotten its theological and philosophical traditions, and its helplessness in the face of evil.